Photo 1: A panoramic view of the Helmand River in Helmand province, along the Iranian border with Afghanistan, (Source: Sgt. Anthony L. Ortiz). Internal renewable water resources are estimated at 92BCM, with another 13BCM coming in from transboundary resources. Surface run-off represents a total of 97.3km3/year, of which 5.4 km3/year come from draining the aquifers. Groundwater recharge is estimated at about 49.3km3/year, of which 12.7km3/year are obtained from infiltration in the riverbed, giving an overlap of 18.1km3/yr. Iran receives 6.7km3/year of surface water from Afghanistan through the Helmand River. The flow of the Aras River, at the border with Azerbaijan, is estimated at 4.63km3/year. The surface run-off to the sea and to other countries is estimated at 55.9km3/year, of which 7.5km3/year to Azerbaijan (Aras) and 10km3/year from effluents of the Tigris to Iraq. About 24.7km3/year flows from the Karun into Iraq, but since this is just before it discharges into the sea, it does not count as inflow into Iraq. Photo 2: The Aras River along the Iranian border with the Nakhchivan, Autonomous Republic of Azerbaijan, (Source: M karzarj). Prior to the Taliban regime in Afghanistan, there was an agreed flow of 27m3/second (850 million m3/year) of the Helmand River entering Iran. However, during the Taliban regime (1995-2001), this agreement ceased completely and caused an economic and environmental disaster in the provinces of Sistan and Baluchistan bordering Afghanistan and Pakistan. 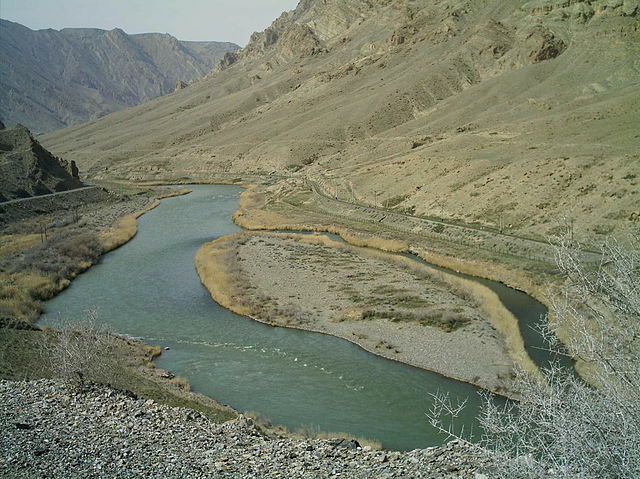 The Helmand River is the longest river in Afghanistan. It stretches 1,150km from the Hindu Kush Mountains about 80km west of Kabul and crosses south-west through the desert to the Seistan marshes and the Hamoun-e-Helmand lake region around Zabol on the Afghan-Iranian border. Torabi-Palatkaleh, S., 2010. Ministry of Energy. AQUASTAT, 2008. Country Fact Sheet: Iran. FAO’s global information system on water and agriculture. Available at www.fao.org/nr/water/aquastat/countries_regions/irn/index.stm. Sadeghi, N., Salih, A., Saeidabadi, M., December 2008. ‘Indigenous knowledge responding to global changes: qanats an ancient sustainable tool for groundwater management’, International Conference on Water Scarcity, Global Changes and Groundwater Management Responses University of California, Irvine.